NOTE: This content is old - Published: Saturday, Feb 17th, 2018. “THOMAS TELFORD” is the title of a presentation to be made to the Wrexham Area Civic Society. It will be given by Graham Greasley, who is a member of Chirk Historical Society, who gives tours of Chirk and of the Ceiriog valleys. He has written about the history of Chirk and its environs. No doubt the Llangollen canal and its aqueducts will be featured in his talk. 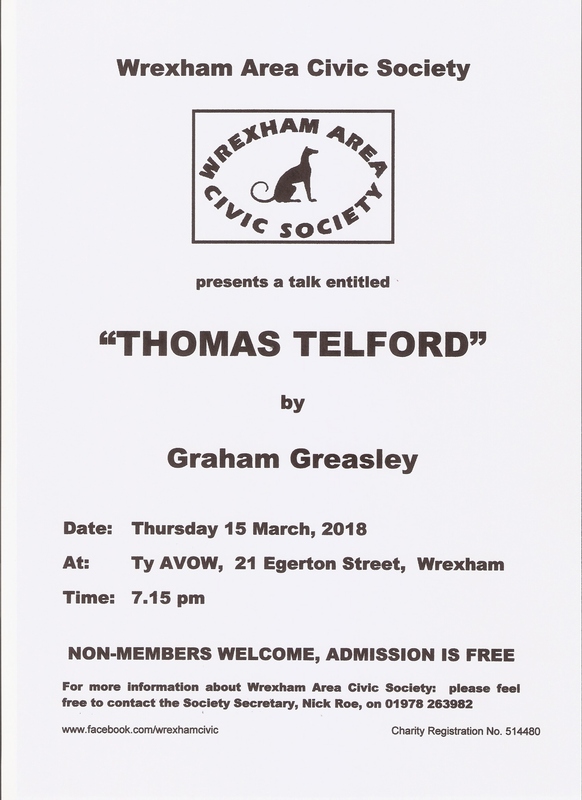 Please come to the meeting, all are welcome, and find out more about the activities of the Society, or visit the website www.facebook.com/wrexhamcivic. Read 1,237,546 times in last 30 days. Read 1,237,546 times in last 30 days, and 73,879,883 times since we started in 2011.